In her tenth collection, Catharine Savage Brosman's singular voice is heard again as she develops themes featured in her earlier work and adds new ones, displaying her full range of poetic craftsmanship and style and, as one critic wrote, using "metaphors brilliantly fitted in detail to the moods and workings of the human heart and mind." A prefatory poem, "To Readers," uses the figure of trees to emphasize the truth, beauty, mystery, and autonomy of poetry. Yet it is clear that in Brosman's work the art of verse is closely connected to human experience, the very feel of which comes through in the poems that follow. The title poem, set in New Mexico, evokes happy moments, good taste in food and art, and serenity, as "all, even regret, [is] silvered in the sunlight and the shade." "A Late Summer Idyll" reinforces that happiness with images of mountains shimmering in September haze, "new currencies of color," and the joys of love. But the note of regret, implied from the outset, surfaces in depictions of the smoky sky over a forest fire. Death presents itself in evocations of a man's last night, a dog soon to die, a botched suicide, and graveyards. Figures connected to wars of the nineteenth and twentieth centuries, including Empress Eugénie of France, appear in elegiac or dramatic poems. The theme of art and its relationship to human striving has a major place, in poems featuring musicians, painters, poets, and dancers. A group of short satiric poems in rhymed tetrameter recalls eighteenth-century satiric verse. Finally, a sequence of twenty poems, "A Voyager's Journal," recreates in varying forms the sights and experiences of traveling in South America. The concluding poem, "Sunset," honors Monet and returns to the serene mode of earlier poems in the collection. 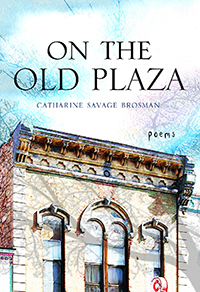 Catharine Savage Brosman knows what she is about: “the aim of verbal art / is beauty, sorcery—seducing mind and heart.” On the Old Plaza is a seductive collection in many ways. It celebrates mature contentment in lyrics like “A Late Summer Idyll,” but it also recounts with charm and liveliness an adventure in “A Voyager’s Journal.” This poet has added another bright honor to her grand career. I have found these poems of Catharine Savage Brosman a constant source of pleasure. Wit, humor, satire, and surprising tenderness are part of these delights, but so, too, is the story of a late romance and the drama and beauty of landscapes. As to be expected in poems written from the advantage of wisdom and age, there are funerals, farewells, and gravestones, but it is the radiance of life—all life—that prevails in this exquisite collection. With a felicity, lucidity, and formal grace unmatched in contemporary poetry, Catharine Savage Brosman’s poems endow me with guidance and joy. Her new collection, On the Old Plaza, foregoes the “old suspicions of unease” for the “language of substantial” illuminations and “currents of surprise.” Articulate, extraordinarily focused, intensely wise, these poems reveal a fecund mind attuned to the highest music—a poetry clear, complex, and timeless. “How would one tell this to the blind—of eye, imagination, spirit?” This is a question Catharine Savage Brosman asks as she describes an astonishing piece of landscape in “Vermilion Cliffs,” but the question generalizes to explain her precision, patience, and painstaking accuracy as she sees through the film of what’s there to the mystery behind what’s really there. She is not showy but is quietly impressive in one after another of these fine demonstrations of the morality of vision. On the Old Plaza is a celebration of American life and landscape.